Last week my partner and I didn't only drive down Altrincham once, we actually went twice. 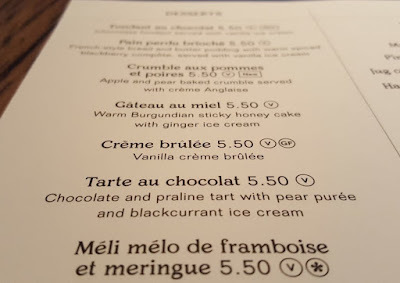 The first visit was a rare evening without any of our children, to review the newly opened Bistrot Pierre French Restaurant, right in the town centre. From the outside very modern, but inside completely different, with warm, dimmed lighting and wooden fixtures, tables and chairs. It has a cosy feel, and a gorgeous grand staircase right in the centre. 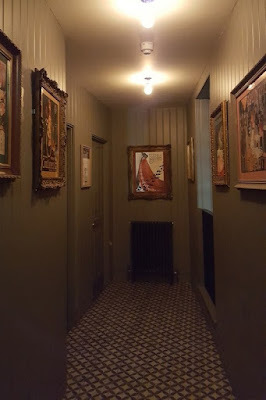 The passageway leading to the toilets only adds to the illusion that you are in a big old house somewhere. Understandably Bistrot Pierre was busy, so there was a 5 minute wait to be seated. The maître d' was clearly doing her best and remained unflustered. We were shown to a table upstairs, where I had an excellent view of the kitchens over my partner's shoulders. I couldn't help but worry about the waiters and waitresses having to carry plates up the grand staircase. I'd actually choose to sit elsewhere if I went again, as every time I saw someone disappear I expected to hear a clatter. It disturbed and fascinated me. The lighting is dimmed and warm, which is perfect for relaxing eating your meal, but sadly doesn't do justice to the photographs. I'm also not a fan of letting my food spoil while I take endless photos, I cross my fingers, snap and eat. 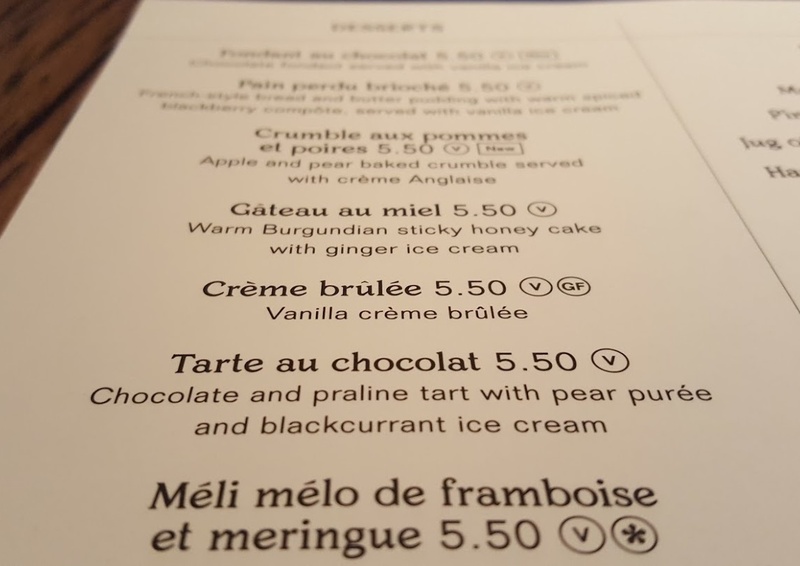 We aren't really drinkers, but the wine list is quite extensive, and Bistrot Pierre even offer menus with specially chosen accompanying wines. There is good choice for non-drinkers too, with my partner opting for Fentimanns Ginger Beer. 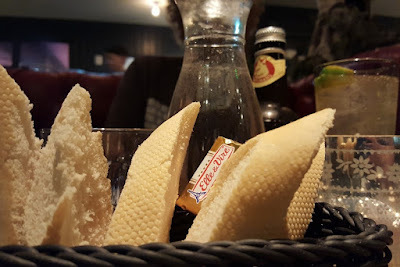 We ate from the a la carte menu, and fresh bread and butter was brought to the table while we waited for our starters. 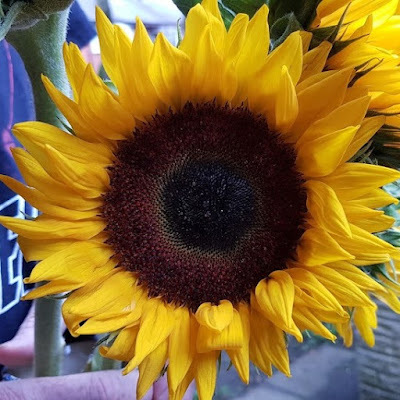 The service all night was unhurried, but never too slow. 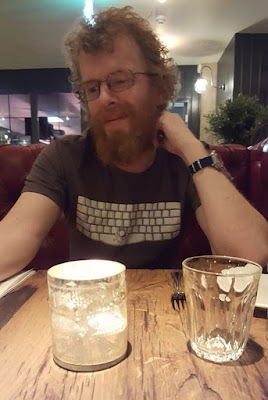 It was easy to relax into the evening, and the restaurant was filled with chatter. He loved it. 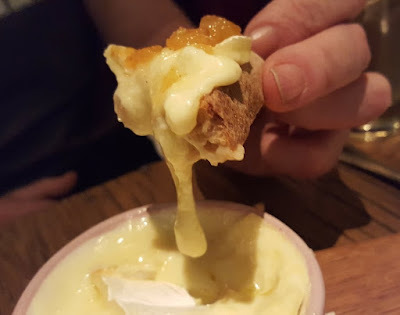 The cheese was perfectly squidgy and the pear chutney worked perfectly. 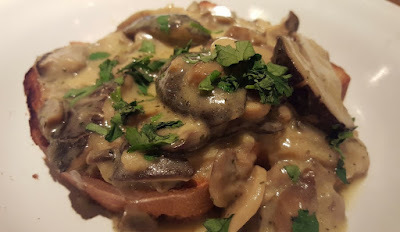 I chose the Brioche et champignons - Toasted brioche with fricassée of mushrooms with (or without) Alsace bacon. I imagine it actually works a better with the bacon, as it did feel it was missing a bit of bite, but still a very tasty dish which was incredibly fresh and rich. I'm a vegetarian who isn't a fan of cheese, so I'm often limited. In fact that left only Tagine de légumes: Roasted root vegetables, chickpeas and apricot tagine. There were also only 2 vegetarian main meals available which were not 'light bites' - something my grown up vegetarian sons complain about frequently. With them in mind, I chose the Ravioli végétarien - which can be served as a starter or a main. 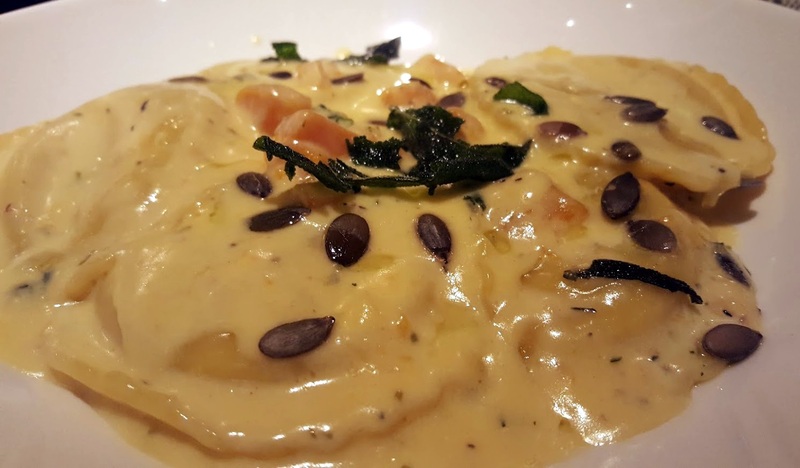 Butternut squash and Gruyère ravioli in a light cream sauce with sage, thyme and pumpkin seed. The sauce was delicious and creamy, yet light and fresh-tasting. The pasta itself was beautifully cooked, and although I'd have preferred a little more texture, as it was very soft, the filling was very tasty. 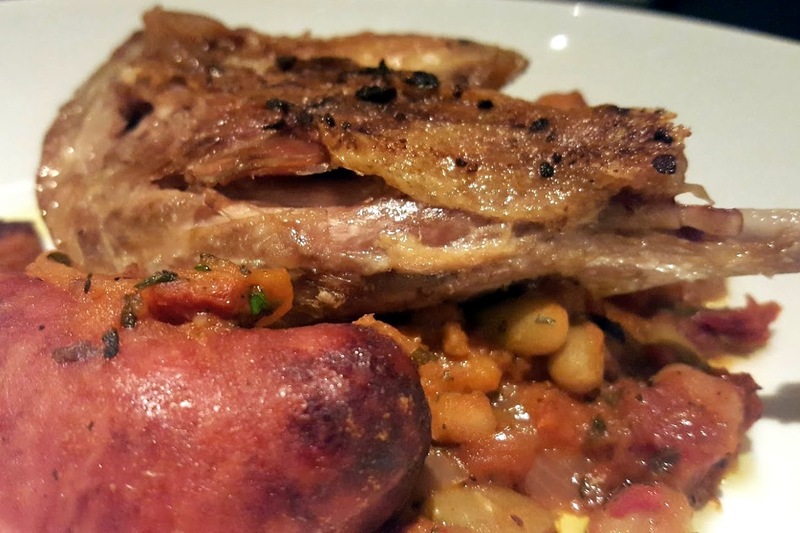 My partner had plenty of choice, and plumped for Confit de Canard “Les Landes” duck leg confit with a cassoulet of Toulouse sausage, smoked bacon, flageolet beans and plum tomatoes. The duck really couldn't have been better cooked. The meat was not at all overdone, good and moist and fell from the bone. The skin was crispy and it was delicious. My partner completely cleaned his plate. 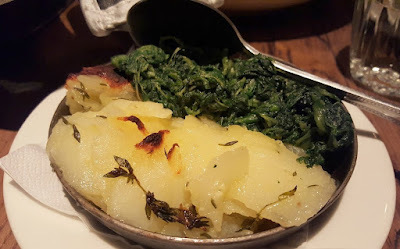 My partner's main course was served with Dauphinoise potatoes and spinach. 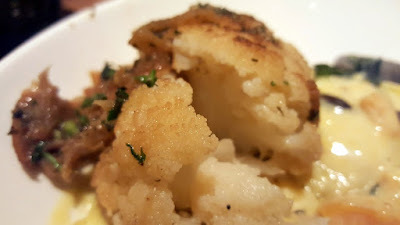 It's in the side dishes that I found Bistrot Pierre really excels. They were amazingly tasty. The potatoes really did melt-in-the-mouth. The French beans with toasted almond flakes were divine. Garlic and almond and then a crunch full of sweet flavour. It pales into insignificance against the Black pepper roasted cauliflower. I could live on this, it was by far the most amazing cauliflower I've ever eaten. 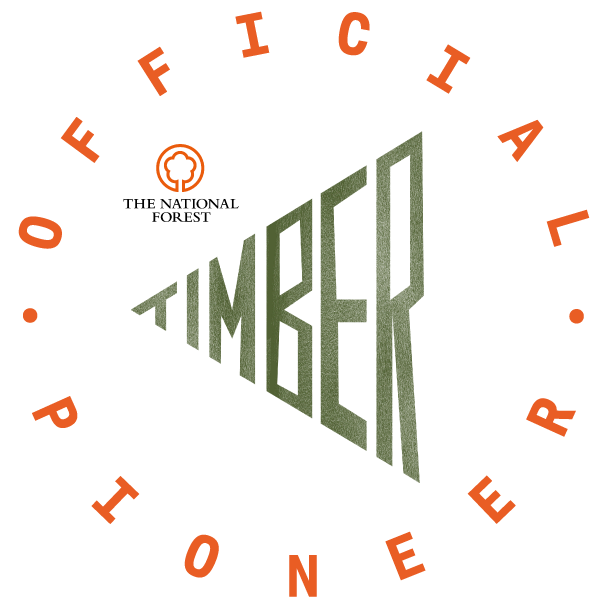 Roasted perfectly to release every molecule of flavour, and coated in a thick peppery caramelised onion topping. This is not the most attractive of dishes, but we found throughout that whatever our meals lacked in colour or visual excitement, the taste really made up for it. 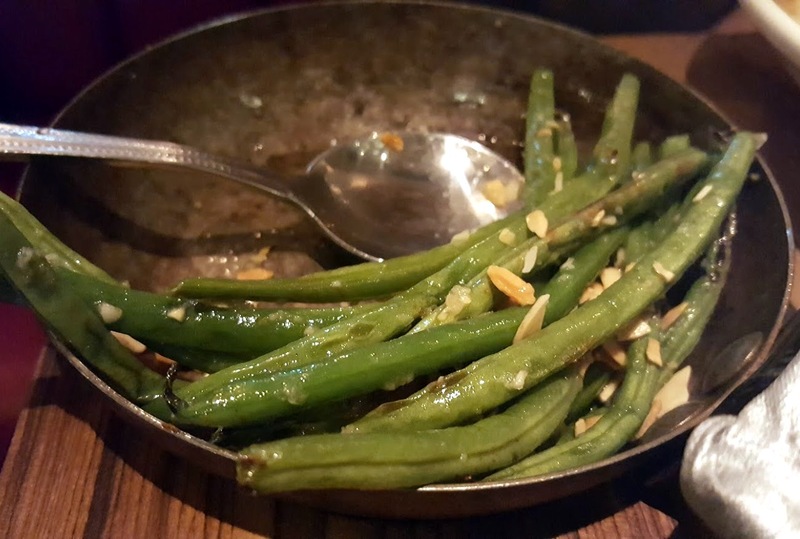 All of the vegetables were really fresh and crisp, and flavours were at their fullest. This was cauliflower turned up to 11. The Dessert Menu wasn't available online, so we didn't know what to expect, but it was a good mix of fruity, creamy and stodgy. The temperature hadn't risen above freezing all day, so that may explain why we both chose a comforting sponge. I chose the Fondant au chocolat (Chocolate Fondant). Perfectly crispy on the bottom, with a lot of filling that poured out when I broke into it. It was not too sweet, and very tasty, with a smooth milky chocolate and a nice soft sponge. 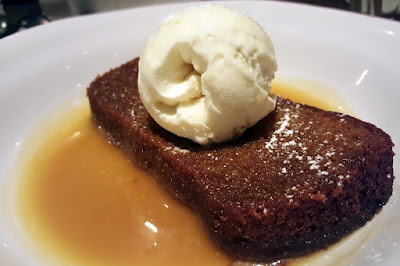 My partner chose Gateau au miel (warm Burgundian sticky honey cake with ginger ice cream). I had to try it. The honey was mellow and actually it was not dissimilar to a sticky toffee pudding, but a very good one. The shape of the sponge means it is slightly crispy over a large area, and it works incredibly well. Our meal was incredibly tasty, we were full and happy, and we discussed vegetable cooking methods all the way home. Bistrot Pierre draw as much flavour as possible out of their ingredients, and really know how to roast. Almost every dish gave new meaning to one of the ingredients, and really surprised us. 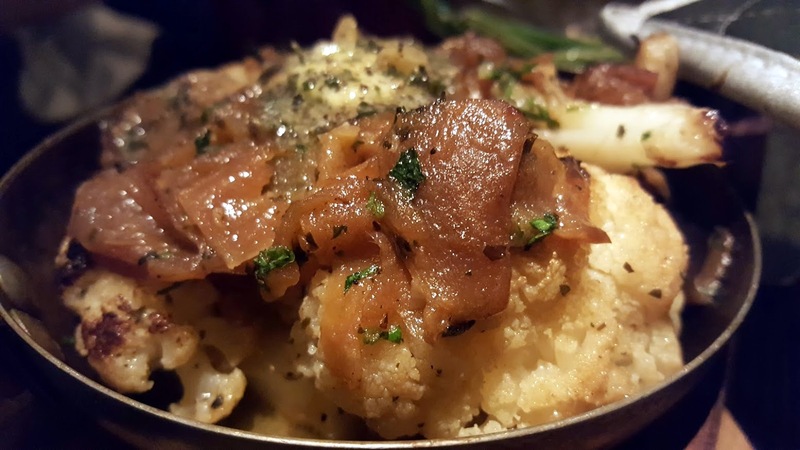 It was a feast for the palate, and the freshness of the ingredients was second to none. I have to mention the staff, as they were all incredibly busy, yet still managed to appear calm and relaxed. We were never rushed, nor did we ever have to wait. Special thanks to Hannah, our waitress, who had Laryngitis and couldn't speak in more than a whisper. Starters were around £6-£7, mains £11-20, sides £3.50 and desserts £5.50. Our 3 course meal with a drink and extra side dishes would have cost around £60, which is what I would expect to pay for a meal such as this. I'd happily pay double for the cauliflower and it would still be unmissable. 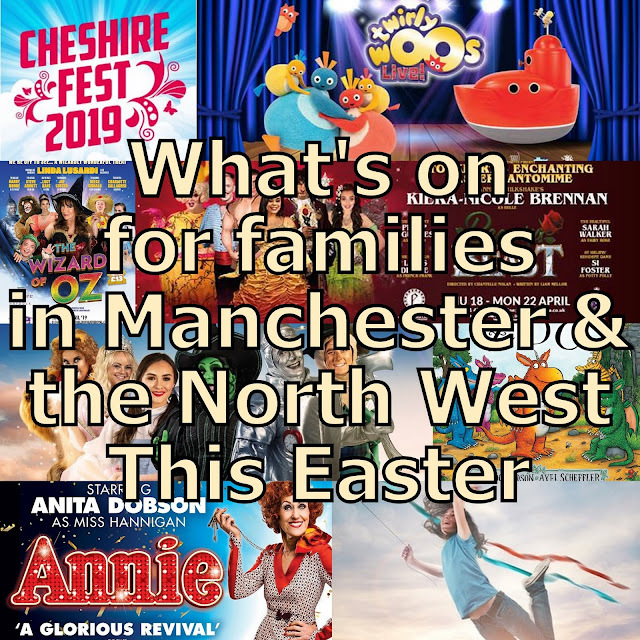 Bistrot Pierre now have restaurants at 20 locations throughout the UK, and have several different menus, including a children's menu. 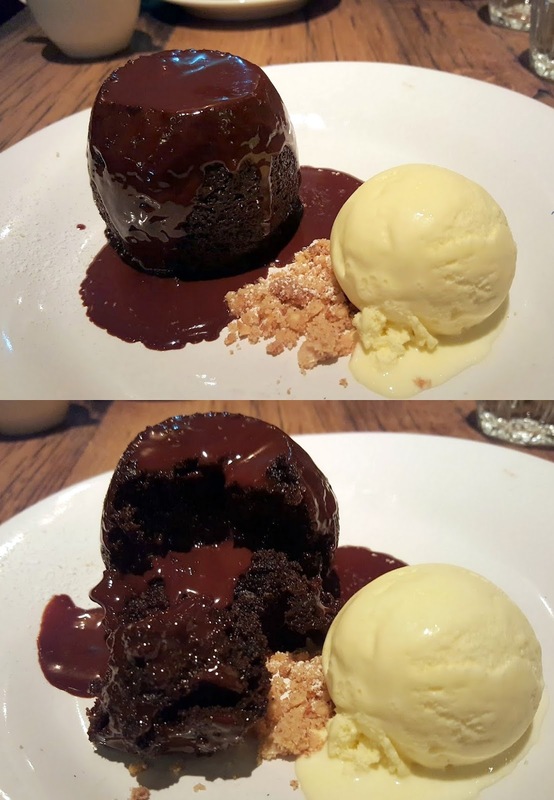 We ate a la carte at the Altrincham restaurant. 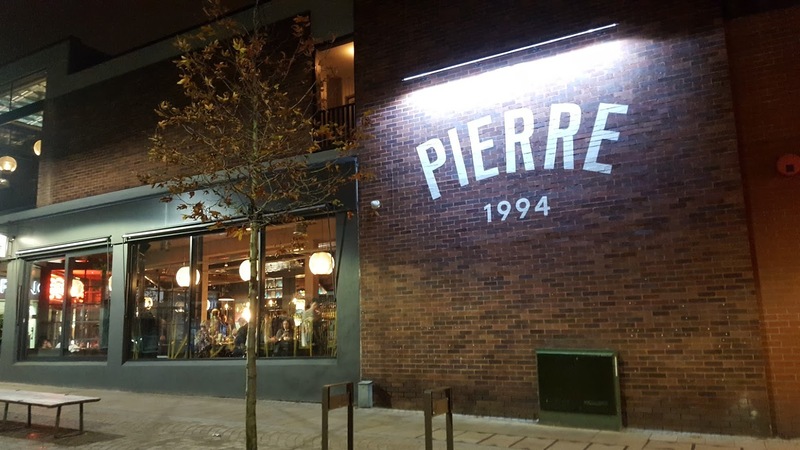 You can find menus, opening times and more information about all of the Bistrot Pierre locations on the Bistrot Pierre website. We've also reviewed the Ayuda House B&B at Bowdon, near Altrincham.